Street in Blairmont, St. Louis. Fate uncertain, slated for demo. From the blog adjunct of the Built St. Louis website [I also added a link to the Blogroll sidebar here]. The author has put up over 200 sequential posts about Blairmont, a neighborhood presently unoccupied, owned by a developer and slated to be torn down. Maybe the economic downtown will become an opportunity for someone to save it. 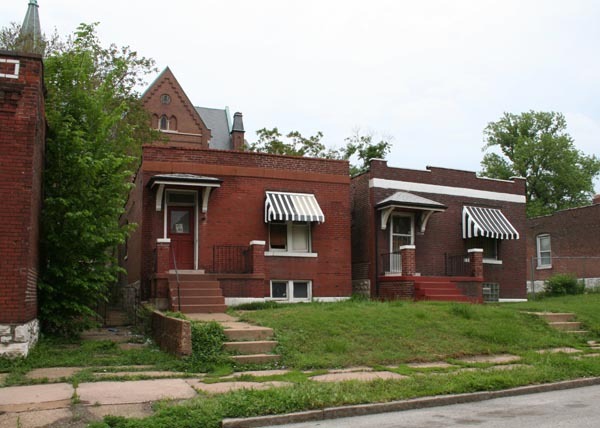 It sounds like it is close to Soulard, an area of St. Louis that has been renovated. It’s painful to see. Most of the houses in Blairmont are masonry and brick construction, high ceilinged, well detailed and built to last. 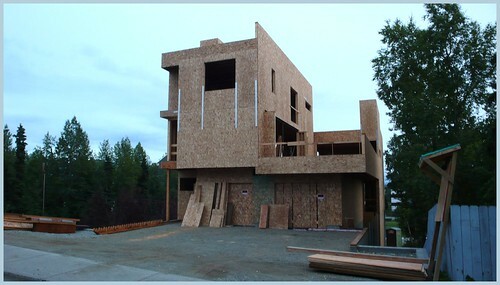 There’s hardly a single house in the state of Alaska that comes close to this quality. I made two trips to the Midwest, in 2001 and 2002. I had an opportunity to look around St. Louis quite a bit. What an incredible architectural heritage and resource. Observing the decline of East St. Louis, Detroit and lots of other places in the region, one sees a modern, senseless and not at all inevitable tragedy. Condo building under construction at 15th and A St.